Last summer, mathematics professor Jia Wan served as a master advisor for incoming students. Frustrated by the scheduling software being used, one of her colleagues commented, “There must be an app for this.” That’s when Wan had an idea. 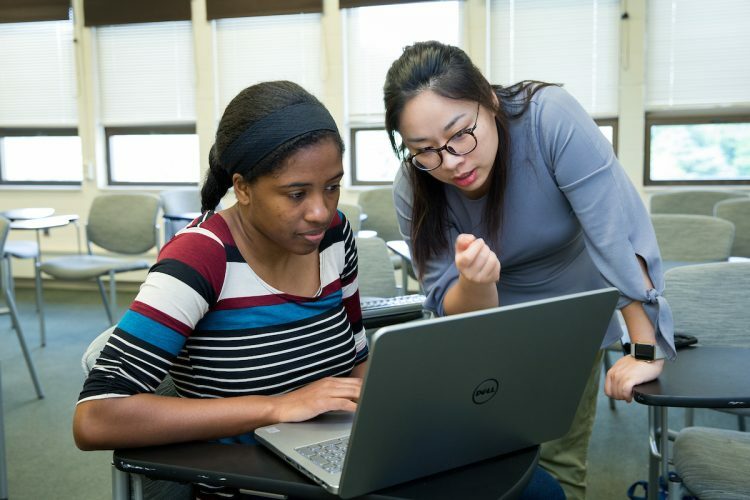 “Because I teach programming classes, I thought it would be a perfect project for students to see what they could do on their own or in a team, and that it could help the College,” Wan said. Taylor Samuels ’18 and mathematics professor Jia Wan compare data about first-year seminar choices. Wan’s idea has turned into a Summer Research project, for which she has partnered with mathematics and economics major Taylor Samuels ’18. Over the course of the eight-week program, they have been meeting with College staff and faculty to make the scheduling system for first-year seminars more efficient and intuitive. First-year seminars are classes that new students choose each summer based on a survey about their interests. 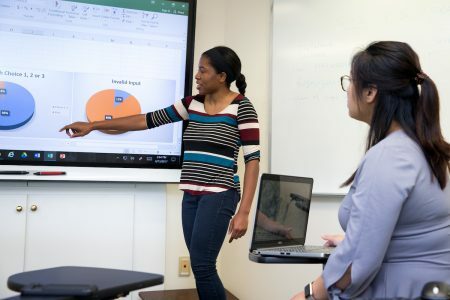 For the first phase of their project, Wan and Samuels have been developing techniques to automatically assign first-year seminar sections to students and meet their overall satisfaction expectation. Their next goal is to produce a new user interface where prescheduling advisors can interact with the software and pick courses for first-year students. The updated system will help advisors check class time conflicts, control total credit hours, spread out courses across the disciplines, and verify prerequisites for any classes automatically. “The point of this is to make everyone the happiest they can be and optimize their first choice in classes they want to take,” Samuels said. Samuels said the project is allowing her to develop and practice computer programming skills. It’s also showing her one of the practical uses for the concepts she learns in math courses. Samuels knew from a young age she wanted to study math, and became interested in economics after taking a class with one of her favorite teachers in high school. When she arrived at Randolph as a recruit for the women’s basketball team, her interests in both subjects grew even more.